February 7, 2012 • Page 6 1815 shop online at www.missourivalleyshopper.com Miscellaneous 1815 Miscellaneous 1815 Bundle & Save on your CABLE, INTERNET PHONE, AND MORE. High Speed Internet starting at less than $20/mo. CALL NOW! 800-314-9361 nani Dish Network $19.99/mo! Free HBO+Cinemax+Starz+Blockbuster! Free HD/DVR! Next Day Install! Ask About Internet/TV/Phone Bundles! 800-732-0574 nani CASH FOR CARS: All Cars/Trucks Wanted. Running or Not! Top Dollar Paid. We Come To You! Any Make/Model. Call For Instant Offer: 1-800-864-5960 nani Dish Network $19.99/mo! No Equipment to Buy! Free HBO+Cinemax+Starz+Blockbuster 3 Months! Free HD/DVR! Next Day Install! Ask About Internet/TV/Phone Bundles! 800-732-0574 (MCN) DIRECTV $0 START COST! Only $29.99/ Month! FREE HBO/ CINEMAX/ SHOWTIME/ STARZ for 3 Months! FREE HD/ DVR Upgrade! FREE Installation! We're Your Local Installers! Order DIRECTV Call Now! 800-758-1657 (MCN) DIRECTV $29.99/mo $0 Start Costs! Free HBO CINEMAX SHOWTIME STARZ! FREE HD/DVR! Free Installation! We're “Local” Installers! 800-355-4203 nani Please Recycle When Done Reading! DISH Network. Starting at $19.99/month PLUS 30 Premium Movie Channels FREE for 3 Months! SAVE! & Ask About SAME DAY Installation! CALL - 888-543-6232 (MCN). DISH Network. Starting at $19.99/month PLUS 30 Premium Movie Channels FREE for 3 Months! SAVE! & Ask About SAME DAY Installation! CALL - 888-543-6232 (MCN) For Sale: engagement ring 1/3 crt. princess cut diamond, 14kt. white gold, GVS2 quality, motivated seller $1300. (402)316-6171 Miscellaneous 1815 Miscellaneous 1815 EARN COLLEGE DEGREE ONLINE *Medical, *Business, *Criminal Justice. Job placement assistance. Computer available. Financial Aid if qualified. SCHEV certified. Call 800-510-0784 www.CenturaOnline.com nani Minnesota?s Best Fishing located on Lake Osakis. Choose from 8 family friendly resorts. Over 6,200 acres of water enjoyment. Free brochure www.PlayAtOsakisMN.com 1-800-422-0785, “Explore Minnesota”. EnjoyBetterTV DISH Network Authorized Retailer Offers, FREE HD for Life, Packages from $19.99/mo. Includes locals, 3 HD receivers free. Restrictions Apply. Call NOW!! (877) 594-2251 nani REACH 2 MILLION HOUSEHOLDS! Do you have a product, service, or business that would be helped by reaching over 2.7 million households throughout Iowa and the surrounding states? The Midwest Classified Network will allow you to reach these potential customers quickly and inexpensively. For more information concerning a creative classified ad call this publication or Midwest Free Community Papers at 800-248-4061 or get information online at www.mcn-ads.com (MCN) MEMORY FOAM THERAPEUTIC NASA MATTRESSES T-$299 F-$349 Q-$399 K-$499 ADJUSTABLES - $799 FREE DELIVERY LIFETIME WARRANTY 90 NIGHT TRIAL 1-800-ATSLEEP1-800-2875 3 3 7 WWW.MATTRESSDR.COM nani Call Classi?eds 665-5884 Reach over 20 million homes nationwide with one easy buy! Only $2,395 per week for a 25 word classified! For more information go to www.naninetwork.com nani USED EQUIPMENT Large Inventory at Great Prices! New Equipment Coming In Daily! USED TRACTORS (C) 2011 CIH Steiger 450, 237 hrs., AFS . . . . . . . . . . . . . $250,000 (A) 2009 CIH MAG 245, 1208 hrs . . . . . . . . . . . . . . . . . . $135,000 (A) 2008 CIH MAG 275, 1835 hrs . . . . . . . . . . . . . . . . . . $135,000 (O) 2005 MTX135 MFD, 3496 hrs w/loader . . . . . . . . . . . . $55,000 (A) 2005 CIH MX210, 2184 hrs . . . . . . . . . . . . . . . . . . . . . $95,000 (O) 2004 NH TS125A MFD, 6440 hrs. . . . . . . . . . . . . . . . . $34,500 (C) 1997 CIH 8920 MFD, 6130 hrs . . . . . . . . . . . . . . . . . . $60,000 (A) 1995 CIH 7230 MFD, 7320 hrs . . . . . . . . . . . . . . . . . . $57,000 (A) 1994 CIH 5250 MFD, 3191 hrs., loader . . . . . . . . . . . . $44,000 (A) 1992 CIH 7130 MFD, 9926. . . . . . . . . . . . . . . . . . . . . . $42,000 (O) 1989 CIH 7140 MFD, 9693 hrs . . . . . . . . . . . . . . . . . . $35,000 (A) 1988 CIH 7130 2WD, 9585 hrs . . . . . . . . . . . . . . . . . . $30,000 (N) 1979 IH 1086, 8150 hrs., loader . . . . . . . . . . . . . . . . . $12,500 (A) 1973 IH 966, 18.4x38, 1 valve, 3 pt . . . . . . . . . . . . . . . . $7,800 (C) JD 3150 MFD, Rops, 6530 hrs., loader grapple . . . . . . $22,500 (C) Ford 3000 gas w/Rhino SE5 mower . . . . . . . . . . . . . . . . $5,350 TILLAGE EQUIPMENT (N) 2010 Landoll VT7431-33’ tillage . . . . . . . . . . . . . . . . . $42,000 (A) GP 2200TT Turbo Till, 22’ . . . . . . . . . . . . . . . . . . . . . . $26,000 (C) IH 4600 ?eld cultivator, 25’, 9” sweeps . . . . . . . . . . . . . $6,900 (N) HDL 30-8 spike tooth harrow. . . . . . . . . . . . . . . . . . . . . $6,500 (N) Besler 3 pt., 8 row, 30” stalk chopper . . . . . . . . . . . . . . $6,500 (O) Kewanee 18’ disk, 3 bar harrow . . . . . . . . . . . . . . . . . . . $2,000 (N) IH 4600 30’ ?eld cultivator w/harrow . . . . . . . . . . . . . . . $2,000 PLATFORMS (N) 2010 CIH 2020, 25’, 3” cut . . . . . . . . . . . . . . . . . . . . . $19,000 (A) 2010 CIH 2020, 30’, tracker . . . . . . . . . . . . . . . . . . . . . $25,000 (N) 2010 CIH 2020, 30’, tracker . . . . . . . . . . . . . . . . . . . . . $25,000 (A) CIH 2020, 25’, 3” cut . . . . . . . . . . . . . . . . . . . . . . . . . . $25,000 (C) 2009 FD70 MacDon 30’ draper . . . . . . . . . . . . . . . . . . $51,000 (A) 2009 CIH 2020, 30’ 3” cut, very good cond . . . . . . . . . $24,500 (O) 2001 CIH 1020, 20’, 3” cut, tracker . . . . . . . . . . . . . . . . $7,500 (A) 2007 CIH 2020, 30’ 3” knife . . . . . . . . . . . . . . . . . . . . . $26,000 (N) 1999 CIH 1020, 25’, 1-1/2” cut, air reel . . . . . . . . . . . . $13,500 (A) 1998 CIH 1020, 25’, Crary, poly, tracker . . . . . . . . . . . $10,000 (C) 1998 CIH 1020, 25’, 3” cut, tracker, poly . . . . . . . . . . . . $9,750 (C) 1997 CIH 1020 25’, 3” cut, poly . . . . . . . . . . . . . . . . . . . $7,000 (N) 1990 CIH 1020, 25’, 1-1 ? 2 knife . . . . . . . . . . . . . . . . . . $7,000 (A) CIH 1020, 30’, good poly & knives. . . . . . . . . . . . . . . . . $6,000 PLANTERS (A) 2010 CIH 1250, 24 row 30”, bulk ?ll . . . . . . . . . . . . . $125,000 (N) 2008 Kinze 3600 twin row 32” row . . . . . . . . . . . . . . . $72,000 (N) 2004 CIH 1200 12 row 30” stacker . . . . . . . . . . . . . . . $35,000 (A) 1997 Kinze 2100 12 row 36” stacker . . . . . . . . . . . . . . $17,500 (N) 1991 JD 7200 16 row 30”, liq. fert. . . . . . . . . . . . . . . . $19,000 (A) Kinze 3600 16/31 row 30” . . . . . . . . . . . . . . . . . . . . . . $85,000 (O) 950 CIH 8 row 36”, liq. fert . . . . . . . . . . . . . . . . . . . . . . $8,000 HAY EQUIPMENT (C) Vermeer R23A twin rake . . . . . . . . . . . . . . . . . . . . . . . . $9,000 (A) Vermeer 605J, twine baler . . . . . . . . . . . . . . . . . . . . . . . $7,900 (C) CIH 8465A baler, 1000 PTO . . . . . . . . . . . . . . . . . . . . . . $7,000 (C) NH 1475 16’ windrower . . . . . . . . . . . . . . . . . . . . . . . . . $6,500 (C) 96 MacDon 5000, 14’ mower cond . . . . . . . . . . . . . . . . $5,600 (N) Hesston 1160 14’ mow cond., 540 PTO . . . . . . . . . . . . $3,000 (O) 1988 New Idea 486 round baler . . . . . . . . . . . . . . . . . . . $3,500 (C) 1994 NH 116, 16’ mower cond . . . . . . . . . . . . . . . . . . . $3,450 (O) Dakon gravity wagon . . . . . . . . . . . . . . . . . . . . . . . . . . . . . $950 COMBINES (A) 2011 CIH 6088, 125 sep hrs . . . . . . . . . . . . . . . . . . . $235,000 (A) 2011 CIH 6088, 211 sep/300 eng hrs . . . . . . . . . . . . $228,000 (A) 2010 CIH 7120, 453 sep hrs., AFS . . . . . . . . . . . . . . . $225,000 (A) 2010 CIH 8120, 463 sep hrs., AFS . . . . . . . . . . . . . . . $232,000 (N) 2009 CIH 7120, 587 sep hrs . . . . . . . . . . . . . . . . . . . $224,000 (A) 2009 CIH 9120, 643 sep hrs . . . . . . . . . . . . . . . . . . . $225,000 (N) 2009 CIH 6088, 556 sep/763 eng hrs . . . . . . . . . . . . $187,000 (N) 2008 CIH 7010, 912 sep hrs . . . . . . . . . . . . . . . . . . . $190,000 (A) 2008 CIH 8010, 700 sep hrs., AFS . . . . . . . . . . . . . . . $200,000 (A) 2006 CIH 8010, 1,122 hrs . . . . . . . . . . . . . . . . . . . . . $170,000 (C) 2003 CIH 2388, 1431 sep/1892 eng hrs . . . . . . . . . . $110,000 (C) 2002 CIH 2388, 1760 sep hrs . . . . . . . . . . . . . . . . . . . $95,000 (A) 1998 CIH 2388, 1695 sep hrs . . . . . . . . . . . . . . . . . . . $95,000 (A) 1996 CIH 2188, 1902 sep hrs . . . . . . . . . . . . . . . . . . . $60,000 (N) 1993 CIH 1644, 3360 hrs. 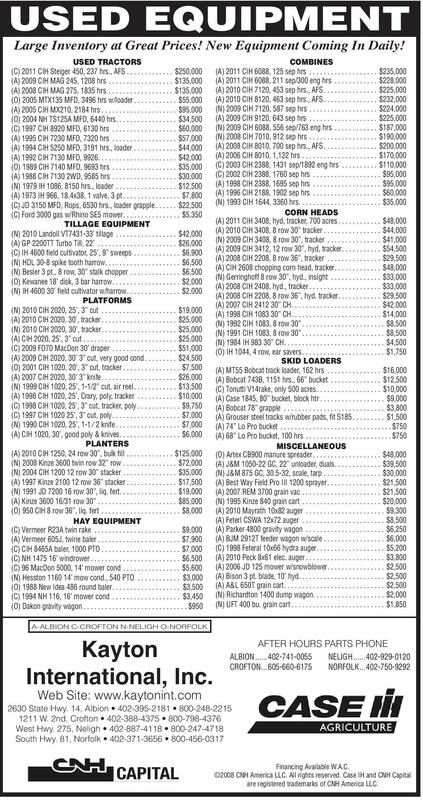 . . . . . . . . . . . . . . . . . . . . . . $35,000 CORN HEADS (A) 2011 CIH 3408, hyd, tracker, 700 acres . . . . . . . . . . . . $48,000 (A) 2010 CIH 3408, 8 row 30” tracker . . . . . . . . . . . . . . . . $44,000 (N) 2009 CIH 3408, 8 row 30”, tracker . . . . . . . . . . . . . . . $41,000 (A) 2009 CIH 3412, 12 row 30”, hyd, tracker. . . . . . . . . . . $54,500 (A) 2008 CIH 2208, 8 row 36”, tracker . . . . . . . . . . . . . . . $29,500 (A) CIH 2608 chopping corn head, tracker. . . . . . . . . . . . . $48,000 (N) Gerringhoff 8 row 30”, hyd., insight . . . . . . . . . . . . . . $33,000 (A) 2008 CIH 2408, hyd., tracker . . . . . . . . . . . . . . . . . . . . $33,000 (A) 2008 CIH 2208, 8 row 36”, hyd. tracker. . . . . . . . . . . . $29,500 (A) 2007 CIH 2412 30” CH. . . . . . . . . . . . . . . . . . . . . . . . . $42,000 (A) 1998 CIH 1083 30” CH. . . . . . . . . . . . . . . . . . . . . . . . . $14,000 (N) 1992 CIH 1083, 8 row 30” . . . . . . . . . . . . . . . . . . . . . . . $8,500 (N) 1991 CIH 1083, 8 row 30” . . . . . . . . . . . . . . . . . . . . . . . $8,500 (N) 1984 IH 983 30” CH. . . . . . . . . . . . . . . . . . . . . . . . . . . . $4,500 (O) IH 1044, 4 row, ear savers . . . . . . . . . . . . . . . . . . . . . . . $1,750 SKID LOADERS (A) MT55 Bobcat track loader, 162 hrs . . . . . . . . . . . . . . . $16,000 (A) Bobcat 743B, 1151 hrs., 66” bucket . . . . . . . . . . . . . . $12,500 (C) Tonutti V14rake, only 500 acres . . . . . . . . . . . . . . . . . . $10,000 (A) Case 1845, 80” bucket, block htr . . . . . . . . . . . . . . . . . . $9,000 (A) Bobcat 78” grapple . . . . . . . . . . . . . . . . . . . . . . . . . . . . $3,800 (A) Grouser steel tracks w/rubber pads, ?t S185 . . . . . . . . . $1,500 (A) 74” Lo Pro bucket . . . . . . . . . . . . . . . . . . . . . . . . . . . . . . . $750 (A) 68” Lo Pro bucket, 100 hrs . . . . . . . . . . . . . . . . . . . . . . . . $750 MISCELLANEOUS (O) Artex CB900 manure spreader . . . . . . . . . . . . . . . . . . . $48,000 (A) J&M 1050-22 GC, 22” unloader, duals. . . . . . . . . . . . . $39,500 (N) J&M 875 GC, 30.5-32, scale, tarp . . . . . . . . . . . . . . . . $30,000 (A) Best Way Field Pro III 1200 sprayer . . . . . . . . . . . . . . . $21,500 (A) 2007 REM 3700 grain vac . . . . . . . . . . . . . . . . . . . . . . $21,500 (N) 1995 Kinze 840 grain cart . . . . . . . . . . . . . . . . . . . . . . $20,000 (A) 2010 Mayrath 10x82 auger . . . . . . . . . . . . . . . . . . . . . . $9,300 (A) Feterl CSWA 12x72 auger . . . . . . . . . . . . . . . . . . . . . . . $8,500 (A) Parker 4800 gravity wagon . . . . . . . . . . . . . . . . . . . . . . $6,250 (A) BJM 2912T feeder wagon w/scale . . . . . . . . . . . . . . . . . $6,000 (C) 1998 Feteral 10x66 hydra auger. . . . . . . . . . . . . . . . . . . $5,200 (A) 2010 Peck 8x61 elec. auger . . . . . . . . . . . . . . . . . . . . . . $3,800 (A) 2006 JD 125 mower w/snowblower. . . . . . . . . . . . . . . . $2,500 (A) Bison 3 pt. blade, 10’ hyd. . . . . . . . . . . . . . . . . . . . . . . . $2,500 (A) A&L 650T grain cart . . . . . . . . . . . . . . . . . . . . . . . . . . . . $2,500 (N) Richardton 1400 dump wagon. . . . . . . . . . . . . . . . . . . . $2,000 (N) UFT 400 bu. grain cart . . . . . . . . . . . . . . . . . . . . . . . . . . $1,850 A-ALBION C-CROFTON N-NELIGH O-NORFOLK Kayton International, Inc. AFTER HOURS PARTS PHONE ALBION ...... 402-741-0055 CROFTON ... 605-660-6175 NELIGH ...... 402-929-0120 NORFOLK ... 402-750-9292 Web Site: www.kaytonint.com Financing Available W.A.C. ©2008 CNH America LLC. All rights reserved. Case IH and CNH Capital are registered trademarks of CNH America LLC. Miscellaneous 1870 WORK ON JET ENGINES Train for hands on Aviation Maintenance Career. FAA approved program. Financial aid if qualified - Job placement assistance. Call AIM (866) 854-6156. nani 1840 Lost and Found Lost: Prescription eye glasses on Tuesday 1/31 in the vicinity of the 24 Hour Express Laundromat, Freedom Value and Bonanza. Call (605)665-8439 1850 Agriculture Mobile Oil 1300, Delvac 15-40 diesel engine oil, 55 gallon factory sealed barrels $11/gallon. 402-649-6711. Wanted: Field cultivator, JD1100, 1010, 960, IH45, 4500, JD875, 885 cultivator, JD7000 planter, JD3800 silage cutter, chisel plow. (605)665-4753 Wanted: Pasture clearing. We grind cedar trees. No shearing or piling. Hartington Tree Service (402)254-6710 Total Tree Service and Tree Moving 1870 Ag Equipment Creep feeder, 2-wheeled, Apche, double side, 1-tongue; 1-sided smal creep feeder; Fairbanks windmill, 24’, 7’ fan, metal anchors, automatic shut-off, still up, pump in casing, (308)940-0145 Ag Equipment Elson Gopher Machine – 3 point connection, needs work, best offer. 2005 Brillion Packer – includes hand held hydraulic unit. 12’ pulverizer, 20” notched wheels. Used very little. Best offer. Disk – 8ft offset, used for cultivating trees. Best offer. 2008 Weed Badger – Model SM1000. Electro hydraulic upgrade. Best offer. Case IH 4210 Tractor – Runs good, 2097 hours. 2008 PTO Hydraulic pump – comes with supply tank and cooler. Best offer. Buyer will pick up items. For more information contact Amanda (605)665-6704. Hutchinson bin fill augers 10”x72’ with spring away hopper. All flighting special order 1/4” thick, hudraulic lift. 402-649-6711. JD 7230 Premium/ Brand New 740 Loader, Bucket, Grapple, low hours Brand new Firestone tires. JD warranty. Financing available. www.perfecthay.com Cell (402)640-1306. Wanted: Antique or Salvage Tractors, any condition. Also gas engines (402)360-2309; or (402)584-2238 leave message.